Z97-PRO GAMER SPEED UP YOUR FUN! Z97-PRO GAMER confounds expectations. 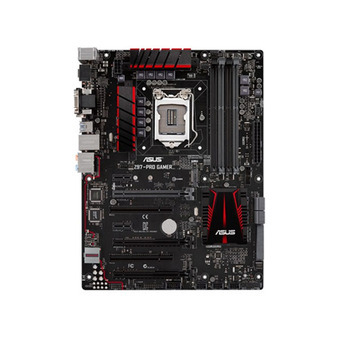 It's an ATX motherboard that packs loads of innovative gaming technologies into a package accessible to everyone. From Hi-Fi-quality audio technology to blazing-fast networking, advanced integrated graphics, and faster gaming with M.2 & SATA Express, every aspect of Z97-PRO GAMER is designed to help you to speed up your fun. Precision-engineered components, hand-chosen for the fun gaming experience, are protected by exclusive ASUS Gamer's Guardian for exceptional reliability and longevity. With an arresting red-and-black theme Z97-Pro Gamer steals attention. It is built for your game Z97-PRO GAMER!